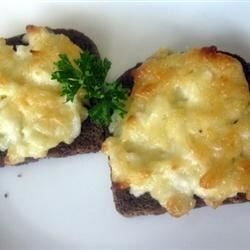 "These little rye bread squares are easy to make and filled with the rich flavor of Parmesan cheese. They're perfect for parties or an afternoon snack." Place the Parmesan cheese, mayonnaise, onion and reserved onion juice in a blender or food processor. Blend thoroughly. Spread the mixture evenly on slices of cocktail rye bread. Place cocktail rye bread slices on a large baking sheet. Bake in the preheated oven 10 minutes, or until lightly toasted. This is great but I add 1 TBS. of horse radish or to taste instead of onion and top with thin slice of pepporoni. I did not like this recipe at all. It was too onion-y and the bread got soggy by the end of the evening. These are wonderful! The second time I made them with Swiss cheese instead of Parmesan and they were even better. These are so easy and absolutely delicious. We used them in our cheesy day at work and they were a tremendous hit. Yup, this was easy and yummy. I made my spread the night before and only had to smear it on the bread. Came out great, everybody ate them up!! This is so awesome! So easy, so quick...and I usually have all the stuff to make if needed last minute! Love them! Tastes similiar to crab rangoon! !